Pope Benedict XVI, who is making his first papal visit to Africa, has said that handing out condoms is not the answer in the fight against HIV/Aids. The pontiff, who preaches marital fidelity and abstinence, said the practice only increased the problem. 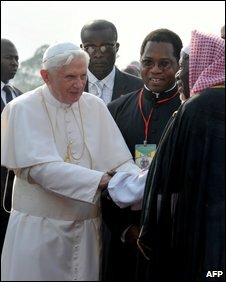 Is Catholicism good for Africa? HIV/Aids was, he argued, "a tragedy that cannot be overcome by money alone, that cannot be overcome through the distribution of condoms, which can even increase the problem". The solution lay, he said, in a "spiritual and human awakening" and "friendship for those who suffer". Speaking at the airport in Cameroon's capital, Yaounde, the Pope called on Christians to speak up in the face of violence, poverty, hunger, corruption and abuse of power. 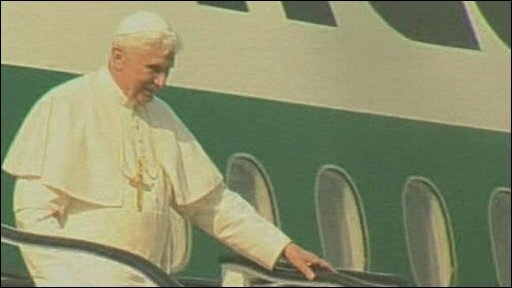 The BBC's Caroline Duffield, in Cameroon, says people in Yaounde have been energetically sweeping and cleaning everywhere in preparation for Pope Benedict's visit. The Pope will stay until Friday in Yaounde, where he will meet bishops from all over Africa who will be taking part in a meeting at the Vatican later this year to discuss the Church's role in Africa.